We’re partnering with Almond Breeze as part of their Serve Up Your Best campaign. Since they’re the official sponsor of Team USA Volleyball, I thought I’d serve up a super healthy recipe today. You can customize these bowls with whatever veggies you like, but my strategy here was to represent every primary color. Well, except blue. Blueberries would be a little weird here. What’s not weird are red peppers, orange carrots, yellow tomatoes, cucumber, baby kale, scallions and shredded purple cabbage. 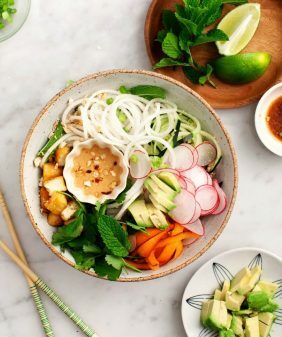 Slice & dice, then toss everything together with brown rice noodles and this light savory dressing that’s made with almond butter, ginger, lime, tamari and creamy Almond Breeze Almondmilk Cashewmilk. This salad keeps well in the fridge – save the leftovers for multiple lunches during the week. This giveaway is now closed, thank you for your feedback! Make the dressing: In a small bowl, combine the almond butter, lime juice, tamari, ginger and garlic. Whisk until smooth. Add the Almond Cashewmilk and whisk to combine. (At this point, the dressing might taste a little salty & strong but once it's tossed with all of the vegetables, the flavors will become more balanced). Chill until ready to use. If it separates, give it a little stir before using. 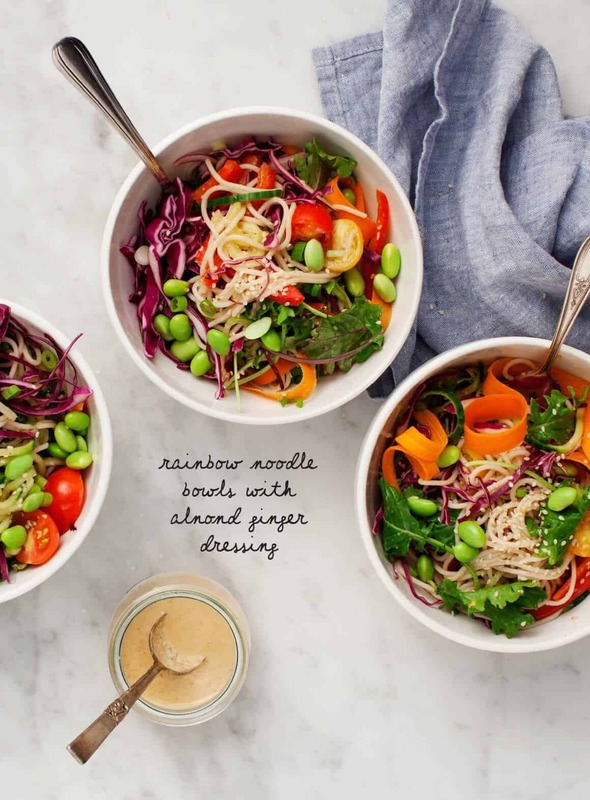 In a very large bowl, combine the pepper, cucumber, carrot, cherry tomatoes, kale, cabbage, basil, scallions, edamame, hemp seeds and brown rice noodles. Add the dressing and toss well so that the vegetables begin to wilt. Taste and season with more tamari, if desired. This post is sponsored by Blue Diamond Almond Breeze Almondmilk. Almond Breeze believes in the best. That’s why we only use Blue Diamond Almonds to make our almondmilk and why we’re proud to be an official sponsor of USA Volleyball. Visit www.ServeUpYourBest.com for a chance to win $5,000 for the ultimate beach day, learn fun volleyball moves, get an Almond Breeze coupon and smoothie recipes! I’m actually making rainbow bowls tonight, but with coconut milk sauce. This post reminded me I have edamame to throw in there- thanks! I make a similar salad all the time! Love the dressing idea. So smart. I make chopped vegetable salads nearly every day, but I do get into ruts and recipes like these change it all up again into something fresh and new. Ginger and lime–I have both but don’t think to use them. So thank you! Re the rainbow: the more colors, the more variety. The more variety, the more likely you have a variety of nutrients as well. Yum! I’m always in search of a new great salad and this one looks like it’s going to hit the spot. Love the colors! 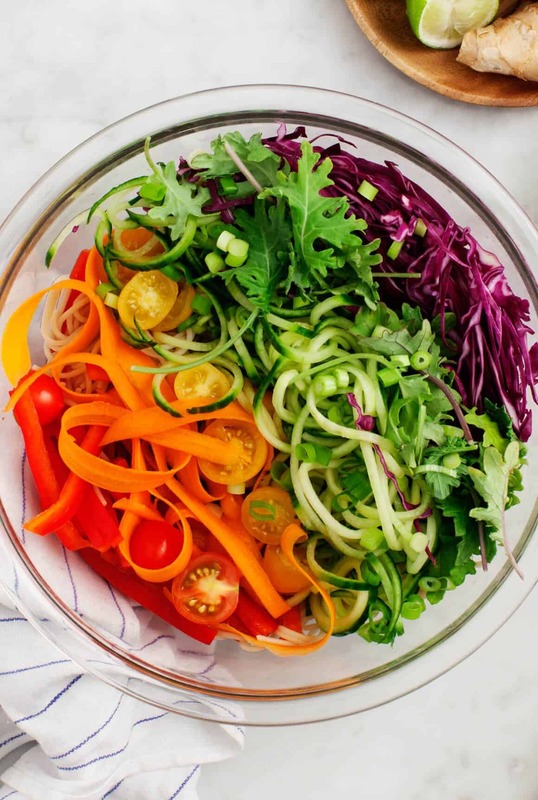 Love the gorgeous colors in this salad! Can’t wait to try it. Thanks! Oh, and I took the survey. Woohoo! I love this! I do something similar using rice noodles (the white, cellophane type you get at the asian grocery store!) The white is a good background for the bright colors from the veggies! Your recipes are always the best- I think I’ve already made half of the recipes in your cookbook! I can’t wait to try this one! thank you! I’m so glad you’re loving the book too! I follow you on IG and Pinterest so much fun! This sounds delicious! I can’t wait to try this at home, especially with this dressing. A fresh salad is always what I crave after travelling. This one looks divine! This looks really good! And took the survey as well! First ever comment, but what we’ll do for gift certificates. I love your salads. Because of your recipes, when my friends get together, I’m in charge of the salad. Together we have converted former kale-haters. Poor girls did not know about massaging their kale. I tell them all about your site. You are appreciated. Thank you. 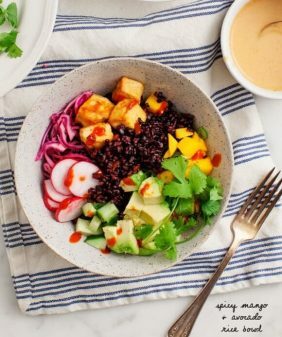 can’t wait to try the dressing – i do not like vinegar and most dressings have a healthy dose of it so anytime i find one without and this one, well just sounds yummy! I am not a big salad eater but this looks good and the dressing sounds so good. This recipe looks great. I will definitely be trying it! I’m looking forward to trying this salad. Thanks for the giveaway ! Beautiful salad. Took the survey. This is gorgeous! Thank you for giving me another way to use my CSA! I just did the survey and ordered your cookbook this week!!! Woohoo!! Reading the recipes gives me thoughts about how I want to prepare our meals. This dressing sounds yummy and will make it this week, especially as it’s the time of year for salads! Thanks for all of your ideas and posts. Love this recipe! And how easy the survey was to complete. 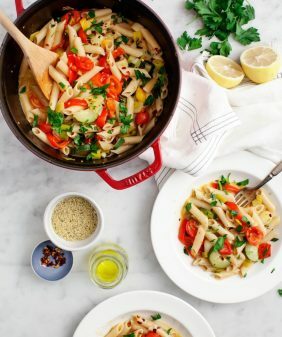 Thanks for making delicious dairy free recipes! This look’s incredible! I can’t wait to make it. Thanks! I’m so glad you both loved the daikon bowls! Filled out the survey! I am a big fan of Almond Breeze almond milk. This salad recipe looks amazing. Heading to the store shorty and putting this on my list. This looks and sounds yummy, with such vibrant colours! Love trying out new vegetarian dishes! Have rated this recipe on its appeal. In response to one of the survey questions – I buy almond milk because regular milk makes my skin break out. TMI? Hello summer in a bowl!! It’s so lovely and bright. Definitely on my “MAKE ASAP” list 😉 I took the little survey also! Hoping to win, wouldn’t that be a nice little birthday treat ☺️ Have a lovely day! These look wonderful! Love how colourful they are! This salad looks so healthy! Any tips for packing this in a to go lunch? Thank you, for giving me a new lunch option. I brought it with me today and it was yummy. I have been trying to jumpstart myself into cooking again after a time of not cooking and I’m finding myself turning to your cookbook and website a lot for your improvisational and assembly type meals. Great one to help use all the great stuff coming from the garden right now! Nasturtium flowers–have you tried them?? I’ve not yet tried this recipe but my rating is based on if I will and if I want to see more like it–and I do! I wouldn’t have thought to use almond milk as a dressing base. Need to try! One look at this recipe and I know what I’m having for dinner tomorrow! What a bowlful of yumminess! Thanks for creating such beautifully delicious and healthy recipes! I feel the same way about vacation. It’s fun to eat decadent meals, but it feels so good to get back home again and pile on the fresh vegetables. I took the survey. 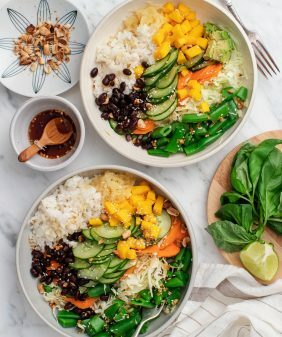 RAINBOW BOWLS W/ ALMOND-GINGER DRESSING looks so good! Happy to do surveys if they help you to continue to provide great content. I love this bowl – I intend to make a version this week. Will probably use almond butter rather than milk or a recipe for a dressing that I already have. Definitely plan to try the dressing recipe. Love the idea of using almond butter and almond milk vs. peanut butter! Looks splendid! 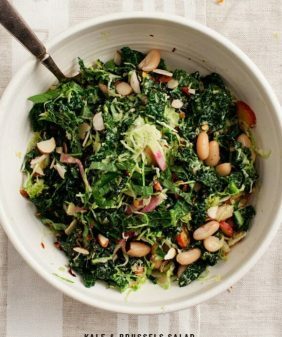 Love the idea of an almond milk-based dressing! we love almond milk – it’s the only milk we buy! 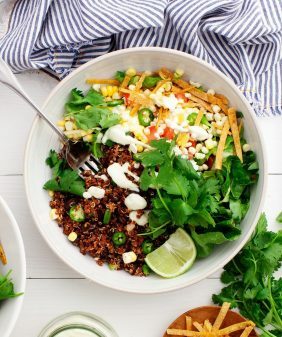 Thank you Love & Lemons for turning me on to Almond Breeze’s Almondmilk Cashewmilk– I first tried it in the sunshine chia seed breakfast bowls and am excited to try a savory application with the dressing for this yummy looking salad! I’m lactose intolerant and sometimes I struggle to make meals. I go to your blog everyday to find delish dairy free options. love this recipe and this blog! I could definitely use some rainbow in my diet right now! My husband is out of town, so we’re eating microwave Trader Joe’s meals, which aren’t the worst, but nothing comes close to fresh. 🙂 Looking forward to making this! Looks great. I took the survey. This looks DELICIOUS! And I took the survey. Those rainbow bowls are so beautiful! I took the quick survey. Looks delicious! I am always looking for some hearty vegan salads to make for work lunches. So just wanted to say love love your cookbook. Thanks for the chance to win on top of it! This was EXCELLENT! This recipe is the first thing I’ve made from your website and they were very good! My parents and siblings loved them and I’m going to gobble up the leftovers tomorrow. Thanks for a great recipe! I took the survey. This salad looks delicious and looks perfect for make ahead picnic lunches! What a beautiful salad!! My husband is the salad maker in our family, so I can’t wait to show this one to him. Love the dressing idea!! It sounds yummy :). Even though I haven’t tried it yet, I gave it five stars – it has everything in it we love! Health kick #768 about to begin, so will try this. This bowl looks like absolute heaven! I want nothing more than to dive in to its beauty! That dressing has gone in my low carb inventory! I love how vibrant this bowl is! It’s like your eating the rainbow haha! LOVE, LOVE , LOVE the Salad dressing with Almond Milk!! I love your blog and your recipes and I am pretty sure I come here daily. Your recipes are always inspiring. And I love your cookbook, too! This dressing looks great! I love almond milk. Completed the survey. Thank you for this great recipe, it looks so good!! I ordered your cookbook last week and completed the survey 🙂 I love your blog, it’s full of healthy and original recipes. Greetings from Québec city! This salad looks delicious and looks perfect for this hot weather we are experiencing! Took your survey…I appreciated the brevity! I took the survey! Also, this looks delicious and I love that it is easily Whole30 adaptable! This looks perfect for a hot summer evening! Looking forward to trying the almond/cashew milk. Thanks! Made this tonight. Did not get the almond cashew milk but used regular unsweetened almond breeze that I had on hand. I’ve made rainbow bowls before, from other blogs, but this is my new favorite!! Five-year old approved as well. Thanks for this delicious recipe! This bowl looks so beautiful and refreshing in the summer heat. I’m going to buy the remaining ingredients right now! I happened upon your site today looking for recipes for a bbq picnic. I will definitely be trying some of your recipes – can’t wait to start with these bowls, they look beautiful. This looks delicious! I can’t wait to try it. Perfect for a summer lunch or dinner. Love your rainbow salad, I think blueberries would be good in the salad. I think I’ll try it! This is *just* the recipe I needed today! Many thanks for posting it. This is amazing! I always do a similar one but with a different dressing, I’m gonna try this tomorrow. Love the post and love the blog! I need this in my belly right now! I hope peanut butter will work as a good sub since I have everything else at home. I have the cookbook at home and absolutely LOVE it. I made the Brussel sprouts and coconut rice dish last night. Like, I literally was casually flipping through the book and found it. I kept staring and drooling at it. So at 9pm, I went to the grocery store, bought the ingredients, and came home and whipped it up for a late dinner. So worth it! See http://www.sipofwellness.com for more good recipes! Having actually made this recipe in the biggest bowl I own (which is LARGE), I had a couple issues. First, I had to leave out the cabbage, edamame, and tomatoes, because by the time I got to them, there was no room in the bowl. At that point, I couldn’t mix everything adequately (due to the bowl being too full) and my noodles clumped in a giant mass. Since the dressing was pretty light, I wonder about halving the recipe next time, but leaving the dressing as written. I also found this to make way more than four servings (without the omitted ingredients). That said, what did come together was tasty. Thanks for the inspiration! I read many recipes actually Indian recipes for health boost. You may find them beneficial. Its about almonds http://www.sipofwellness.com how Indian ayurvedic uses Almonds for beauty and attraction.